RT-N18U features top-of-the-line hardware specifications. An 800MHz processor with high clock speed delivers fast and responsive USB and WAN to LAN performance; while TurboQAM™ technology raises the 2.4 GHz band speed from 450 Mbps to 600 Mbps for a 33% boost. 128MB flash and 256MB RAM ensure a massive data pipeline of up to 300,000 data sessions and multitasking capability, making it perfect for gaming or high-load network environments. The energy-efficient ARM-based CPU reduces power consumption to even help you save on the bills. In addition, ASUS AiRadar intelligently strengthens wireless connectivity using universal beamforming, high power amplification and exclusive ASUS RF fine-tuning for a 150% increase in coverage1 , so even legacy 802.11b/g/n clients can benefit from this technology. RT-N18U also incorporates more user-friendly and intuitive software. With the ASUSWRT interface, you can easily set up the router within 30 seconds2, or switch RT-N18U between its various modes. You can optimize speed with the built-in Smart QoS function, or turn the USB storage attached to the router into a personal cloud with ASUS AiCloud. At the heart of RT-N18U is a powerful but energy-efficient ARM® Cortex™-A9 processor running at 800MHz that ensures fast and responsive performance. The 128MB of Flash memory and 256MB of DDR3 RAM further enhance multitasking performance and allow up to 300,000 concurrent data sessions — making RT-N18U ideal for multimedia applications such as HD video streaming, online gaming and file sharing. RT-N18U features TurboQAM™ technology that boosts 2.4 GHz wireless speeds from 450 Mbps to up to 600 Mbps for 33% faster Wi-Fi performance. Now everything you do online is done faster. Equipped with Turbo NAT and built-in Gigabit Ethernet, RT-N18U gives you full Gigabit internet performance, making its WAN to LAN throughput up to 2-5 times that of traditional software-based NAT Gigabit routers. Turbo NAT handles simultaneous wired connections, achieving maximized total concurrent speeds. So go ahead: game, stream and download from desktops, notebooks, tablets, smartphones and game consoles at once minus the performance loss. ASUS AiRadar intelligently strengthens wireless connectivity using universal beamforming technology, high power amplification, and exclusive ASUS RF fine-tuning. This ensures extended coverage, dynamic data speed increases, and enhanced stability and is backward compatible with 802.11b/g/n clients. Because connection strength varies based on your environment, RT-N18U uses three external antenna to detect wireless device locations and shape transmissions so they’re optimized for the fastest, most stable connection strength. Make RT-N18U your media and device center. With built-in two USB ports, connect external storage drives, printers, scanners and many other USB-enabled devices to share with your networked PCs. Having your devices networked, lets you access them easier than ever before. The conveniently located front USB 3.0 port provides 10x faster data transfer speeds than USB 2.0, making it perfect for high-speed file sharing or audio and HD video streaming. Massive online multitasking at up 300,000 concurrent data sessions gives you 20 times the capacity of mainstream routers for great performance with no slowdown even during heavy traffic sessions. Download multiple files at once, experience smooth HD streaming and play lag-free online gaming all at once. Do more without compromising your online lifestyle. RT-N18U offers a simple VPN server and VPN client setup to access a home network or the internet privately and securely. Easily set up a VPN server with OpenVPN and PPTP protocol support with no need for paid VPN services or a dedicated VPN server. RT-N18U also turns your network-connected devices into VPN-enabled clients via OpenVPN, PPTP and L2TP protocols without additional VPN software required. ASUS routers with EZ Switch give the flexibility of simple router, repeater, access point and media bridge mode selection. 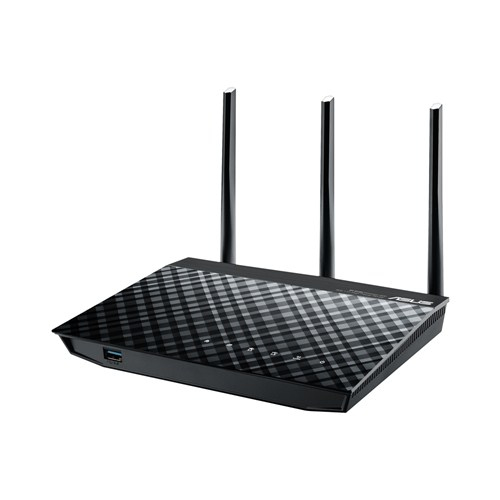 Router mode is the standard wireless and wired operation, while repeater mode extends existing Wi-Fi coverage, and access point mode connects with wired routers to instantly add wireless capabilities. Media bridge mode enables instant wireless for all your Ethernet devices. Switching occurs on the hardware level, meaning true 4-in-1 versatility with no delays and no complicated menus to go through. Easy to use and highly intuitive, ASUSWRT dashboard UI offers complete network management. Whether you’re a gamer or HD media enthusiast get improved performance with Smart Quality of Service (QoS) bandwidth prioritization that optimizes internet speeds for your specified tasks. Plus, the traffic monitor allows you to check your web usage in a clear graphical interface. Along with that, the Download Master feature ensures better network productivity and management. One-click settings enable easy troubleshooting, printer setup and parental controls. Exclusive Download Master uses a special data acceleration algorithm to increase download speeds to save you time. With USB storage devices connected to the router, downloads can continue uninterrupted in the background even when your PC is turned off for added convenience.